We often think in the context of our lives in the USA and assume that everyone else is living as we do. Several Texas Rotary Districts undertook a project to collect books and ship them to where they were needed in 2001. 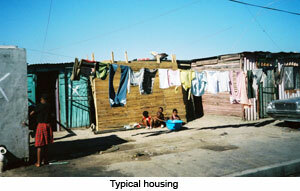 The project touches the great need for literacy in Southern Africa. The project started from a few Rotary districts to Rotary District 9300 in South Africa and now has spread across the USA and throughout Southern Africa. In 2001, District 9300 had developed a model operation that solved many of the problems of donated material transfer and distribution. Rotary Clubs in the United States now have a seven year history with the project and can affirm that the Rotary District 9300 model works well and is worthy of replication in other locales. With the emphasis on literacy in Rotary, our Rotary Books for the World project is an easy and natural service project for clubs to adopt around the world. We are continuing strong support to the District 9300 efforts in Southern Africa because many of the Southern African countries are relatively new countries. Their economies are struggling to absorb over 10 million refugees from the north. The South African Rotarians are trying to help not only the schools in South Africa but to assist areas of great need in Southern and Eastern Africa. 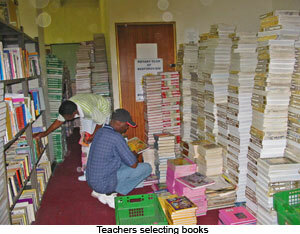 The Books for the World Project has distributed books to qualified institutions for over a decade now. More than 6 million books have been distributed. Why is there such a demand for books? The governments of Southern Africa can not yet underwrite the costs of all the books needed for the rapidly growing public and private school systems. Many countries in Africa do not offer public education to all their youth. Poverty rules in these countries. Without educating their youth, they will not be able to grow a work force that can feed their people and poverty will continue to rule. Where poverty rules hate also rules. The Rotary Clubs in the USA and South Africa are addressing the needs of the impoverished schools and libraries for books and other educational materials which assist both our literacy and peace initiatives. Imagine trying to teach without any books for yourself or your students. Rotary District 9300 personnel have actually been asked to cut books in half so that two students could have something to read. Rotary's response has been to supply a complete book to every child. In the USA, many schools shred a book when it is out of adoption or discard them in a landfill. The books can be obtained without charge from educational institutions, libraries, and private collections. By participating in this program your Rotary Club can make a difference for your schools by relieving their book storage, transportation, and destruction costs. Imagine trying to teach without text books for all students. District 9300 has actually been asked to cut the books in half so that they would serve twice as many students. Rotary's response has been to supply a complete book to every child that does not have one. In Texas, we shred a book when it is out of adoption which may be as short as three years or as long as seven years. The books can be obtained without charge from the public school systems. By participating in this program your Rotary Club can make a difference for our schools by relieving their storage, transportation, and destruction costs.